Posted on 30. Jan, 2010 by Corey in All, NCAA Basketball. In 2005, ESPN decided to spin-off of the success that College GameDay was having in college football and create a college basketball version of the show. On January 22, 2005, the show aired on the campus of the University of Connecticut Huskies. 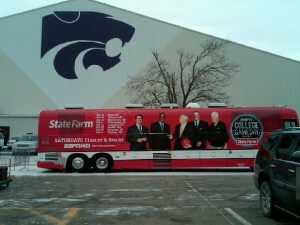 Now, in its sixth season on the air, the show has made its way to Manhattan, Kansas, home to the Kansas State Wildcats. Today the show will air live from Bramlage Coliseum, otherwise now known as the Octagon of Doom as KSU hosts the Kansas Jayhawks. 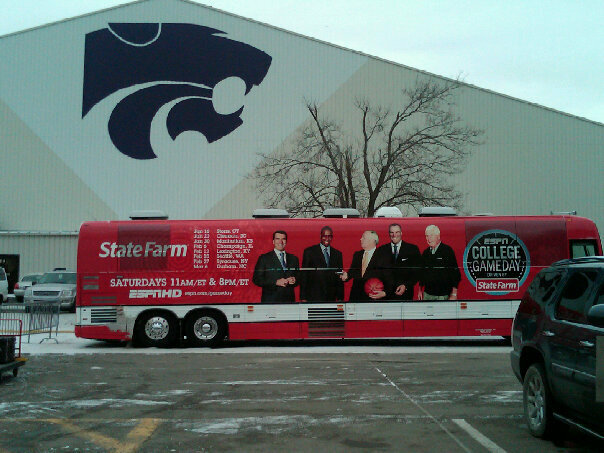 This marks the shows first appearance on Kansas State’s campus for basketball, and makes KSU the 16th different school to host both the football and basketball version of College GameDay. You can check out this show on ESPN airing live at 11 AM and 6 PM eastern standard time. The series began its sixth season on January 16, 2010 from Storrs, Connecticut, where, for the first time ever, it was on site for a women’s college basketball game. Now in week three, it is in the Little Apple. Please click HERE to see the official College GameDay website. Below are two pictures that KSU video coordinator Dylan Lockwood sent me. The first is of the bus pulling up to the arena yesterday. The other picture is of Lockwood doing his “Digger Phelps” sitting at the set that was built courtside. I only wish I was able to head to Manhattan for today’s experiernce. 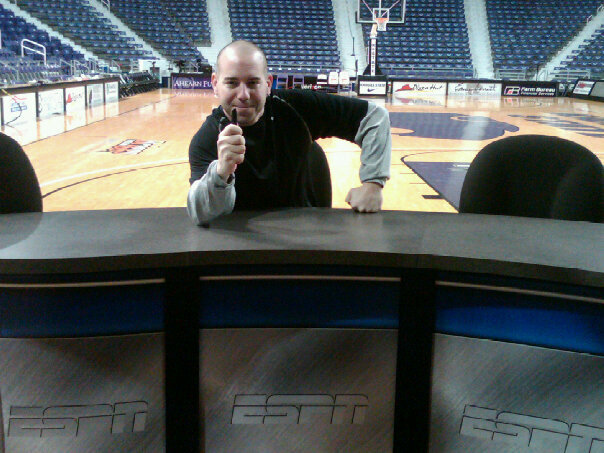 I have been fortunate enough to attend two KU-KSU games at Bramlage, and there is nothing like it. To me, it was way more intense than any of the Xavier-Cincinnati games I have attended over the years. There is no telling what kind of signs the students will have or if they will again throw live chickens on the court, but one thing is for sure, FEAR THE BEARD!! !